As Ilan Pappe has said, most Israeli Jews have no idea of what they did to the Palestinians in 1948. (He also said that those who do know don’t think that what was done was wrong). But that’s only the tip of an iceberg of ignorance. Because of the mainstream media’s complicity in Zionism’s suppression of the truth of history as it relates to the making and sustaining of the conflict in and over Palestine that became Israel, most Americans and Europeans of all faiths and none have no idea of the enormity of Zionism’s crime. 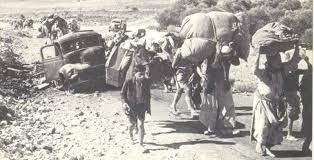 The Arabic word for what happened in the months before and after Israel’s unilateral declaration of independence on 14 May 1948 is Nakba, meaning catastrophe. That’s a one word description of the fact that upwards of 700,000 Palestinian Arabs were dispossessed of their land, their homes and their rights, but complete understanding requires knowledge of something else. Nakba was not simply an event in history. It is a process of ethnic cleansing, a process that has been on-going for 64 years to date and is continuing. A timely reminder of this fact was contained in an article for the web site This Week in Palestine by Ibrahim Matar, an economist writing from Jerusalem. He opened his piece by quoting a statement made by Ra’anan Weitz, the director of the Jewish Agency’s Settlement Department in 1948. “I ploughed Palestine into earth by ordering the demolition of 300 abandoned Palestinian villages from the Negev to the Galilee.” (The quotation was from an interview Weitz gave to the Jerusalem Post published on 7 March 1997). “The bottom line to the tragedy of the Palestinians is that the Catastrophe of 1948 is still going on, as Jewish colonisation of the West Bank continues to expand. The objectives of the Jews have not changed since the early part of the twentieth century. Their motto continues to be ‘dunum after dunum of land’ for the exclusive use of Jews. Question: Is completion of the liquidation of the Palestinian presence in historical Palestine really Zionism’s mission? I believe the answer is “Yes”, and that unless the major powers led by America summon up the will to call and hold Zionism’s monster child to account for its crimes, there will be a final ethnic cleansing of Palestine at some point in a foreseeable future. I also believe that Matar should be more precise with his language. His use of “the Jews” implies that all Jews everywhere are responsible for Zionism’s crimes. That is not so, but… If the rising global tide of anti-Israelism is not to be transformed into anti-Semitism, making another great turning against Jews everywhere inevitable at some point, the Jews of the world must play their necessary part in containing and confronting Zionism. As I never tire of pointing out, silence is not the way to refute and demolish a charge of complicity in Zionism’s crimes. This is pure antisemite dialect. how unfortunate for you, that all those milions, did not achieve their goal, this is the outcome of the attack on Israel, where is the Nakba celebrated in the arab countries, that used the Palestinians for years as their weaponds, they called the Palestinian to escpae and return back after NO jews will remain. getting back to Antisemite dialectic. your claim, that because of the state of Israel, Antisemitism will come up, makes me wonder, if anyone would think that, Christian who killed miliions in WW wars, or Budist who killed millions in Asia, will bring to a Antichristian or Anti budist wave, as antisemiteism, that came out for centuries "with no cuase" and you are using this antismite dialect, to frightened the Jews to become antisinist, if they don';t want a hitler again. Bob, if you would try harder to make sense perhaps someone would listen to you. Zionism feeds anti-semitism - the zionist narrative promotes Jewish interest over everyone else's, for one thing. The horrific treatment by the Israelis of the Palestinians is mute testimony to the destructiveness and evil of zionism. Zionism's effect on the world in general - from its political hegemony to its banking practices - incites hatred of Jews because people believe what Zionism insists on - that Zionism represents the beliefs of all the world's Jewish people (which is not true). The Nakba is not "celebrated." One does not celebrate a catastrophe, which is what the word "nakba" means. It is mourned. Neither of which Zionism or Israel could exist or have become, or the invasion or infiltration of Palestine and the USG could have happened, or have become what they are today without the continuous and enormous support of American Jewry, AIPAC, the ADL and their too numerous to mention affiliated organizations and agencies such as the Jewish Community Centers, etc. all assets and agencies of Zionism, most of them subsidiaries of Mossad the Israeli Intelligence and covert Security Agency.... to Israel what the Shutzstaffel were to Nazi Germany, employing most of the same tactics. Most Americans, of the estadosunidienses type in particular, are a spoiled and cosseted lot who are uncomfortable with any intellectual heavy lifting, and would rather tune in a good football game and tamp down reality with another beer than suffer the effort to think critically and work out a problem which may require additional intellectual and, heaven forbid, some actual physical effort on their part to fix. They live in a "Let James do it," attitude. James, of course being the infamous black Pullman Porter of that original aphorism. And those totally brainwashed will continue to ignore a most inconvenient truth. I feel ashamed. Former Israeli cabinet minister, Shulamit Aloni during her August 14, 2002 interview with Jewish Amy Goodman of Democracy Now! said: “Well, it’s a trick, we always use it. When from Europe somebody is criticizing Israel then we bring up the holocaust. When in this country (US) people are criticizing Israel then they are antisemitic. And the organization (Israel Lobby) is very strong and has lot of money. And the ties between Israel and American Jewish establishment are very strong – and they are strong in this country as you know. And they have power which is ok”. Bob should read the history a little closer. The resistance to Jewish incursion from outside of Palestine was small, undermanned and not centrally directed. In numbers alone, not to mention experience and training, Palmach outdid the competition. Palestinian resistance was also unformed and poorly financed. The Zionists intended then -- and intend now -- to dispossess all Palestinians and to steal their property. This process rolls on and on as F-16s and tanks attack a civilian population in Gaza and settlers simply take whatever they want. Not a single Jewish child has died as a result of a Palestinian F-16 bombing. Not one. No Israeli building was ever destroyed by a Palestinian tank. Call this "war?" It is murder. Zionism is a curse that has made me ashamed of my own Jewishness: My son carries this shame into the future. As for antisemitism: Resisting greedy Israelis and their backers in America is not antisemitism. Antisemitism, the Jews would have it, is "irrational." Resistance to gangsterism and oppression is not irrational. As long as Israel claims to represent all Jews, this rational form of resistance against all Jews will continue. Bob can call it antisemitism, it makes no difference to me. Zionism has destroyed the Jewish soul perhaps forever. At one point in my rage against these liars, I packed up my religious paraphernalia in a box and put it in the garage, disowning a heritage of light of which I was proud. Israel is a sickness, a demented sickness, and Israelis are dupes and fools and would be better off -- not to mention happier -- in Miami Beach. Not a day goes by that I do not do something, some gesture, to support the Palestinians and justice in the Middle East. Not a day. Bob has simply been told lies and he is all to willing to believe them. "As long as Israel claims to represent all Jews, this rational form of resistance against all Jews will continue." - History repeats itself right in front of our faces. A small group of Zionist Jews spoke for those millions in Europe during WW2 and allowed them to be sacrifaces so that Palestine could be made into a new homeland. Their goal is not finished, so keeping their own in ignorance is one of their tactics. Too much hearing of this issue has made them dull of hearing. Zionism must be defeated incrementally. Starting with loosening their media monopoly by persuading the FCC to implement its supposed anti-monopoly rules. I am ashamed to say; that the zionist propaganda has proved effected against myself. I caught myself the other day looking at a Jewish person and wondering if they had murdered a child or supported the murder of a child. That was my first thought. My second was to instruct myself that this person is a Jew and not a zionist. That there is no reason why a Jew in Australia would be involved in child murder. This just goes to show how effective the zionist propaganda has been. It is no wonder that anti-Semitism is on the rise. Or really I should say anti-Jewishness. Anti-Jewishness being the more accurate term. While it has been said before it needs to be said again. Jews everywhere need to stand up and dis-associate themselves from Zionism. If they don't, they will be labelled as zionists. I never had negative attitudes toward Jews. If anything, I remember being told as a child how much the Jews had suffered in the holocaust and how I should be nice to them. I worked with Jews off and on throughout my career, never thought of them as being anything particularly special - in a public service career, I've worked with just about every kind of humanity one can think of. At present, my best friend is a Jewish woman who converted to Judaism before marrying her ex-husband. An intellectual, she's a wonderful source of information about the religion, and one of the best examples of how a person can be a Jew and be adamantly anti-zionist. The only thing that creeps into my mind is the fact that the majority of the world's big bankers are Jews. I do not believe in conspiracy theories about the Rothschilds, Bilderbergs, the Illuminati or whatever, but the fact that Zionist Jews are such an influential presence in the world banking system is significant. Money controls everything; it controls foreign policy, including war and peace. It is up to jews to disassociate themselves from zionists, Not enough of them do. There is a lot of social pressure on Jews to support Israel - the "self hating Jew" is the one who is not a Zionist. Throughout Israel's history, its prime minister has always seemed to have taken it upon himself to presume to represent the whole world's Jewish population. And most Jews are conditioned by the holocaust narrative to believe the Jews must have a homeland - as this homeland will serve, presumably, as some kind of bunker to hide in should the world decide to "exterminate the Jews again." Things might get better if Israelis would stop electing Netanyahu. Hi Maryam, in regards to your point on conspiracy theories. I tend to believe. Not whole heartedly but I do believe it is a possibility and I am just waiting and watching. I believe this for two reasons. Firstly; it is human nature to conglomerate. For example; I know that India, china, and Japan all had a waring states period that only finished when the various states had all be conquered by one person. I have no problem at all in believing that there is a group that wants to control the whole world. Point two. Jews are very good at banding together to assist to propel one person up the ladder. That person then works to pull up the ladder those people who assist him into that position. I remember a few years ago, there was a group of Jews or zionists in the US that formed an illegal human organ trading network. The people involved were the leading citizens of 3 or 4 small towns. They were council members, Mayors, lawyers etc. It is a shocking story that you should be able to find. It was at the time a Swedish newspaper printed a story about the IDF killing people for their organs. I don't believe in conspiracy theories because I think they are disempowering - they distract people from doing the things they can do to effect change, and instead convince them that it is useless to fight these secret cabals (after all, we don't even know who these people are other than a nebulous group of filthy rich elites, right?). Believing in the Illuminati and that other nonsense actually distracts people from using the most effective tools at their disposal - their votes, their voices, and their financial support - to effect change. In a world based on instant gratification, people are less inclined to do the work and put in the time to push through changes, so it's much easier to throw one's hands in the air and blame a secret star chamber of rich Jews for all the world's ills and have another beer. I read about the organ theft case. What has it got to do with anything, other than you revealing your possible bigotry against Jews? I personally don't feel dis-empowered but then I am not the model upon which humanity is cast. While as I have said; I do believe in man's desire to conglomerate; I do not assign any name such as Illuminati to those who want to rule the world. To use that name would attach a history and a purpose; none of which I claim to know or understand. I am simply stating man's desire to wrought change, to build and to control. My comments, which you took as bigotry, was simply made to provide you with a modern, relevant and proven example of a Jewish network of highly placed and respected individuals; complete with factual data: should you wish to research it. You are spot on David King. Don't be intimidated by name calling and labels, that is all they are meant to do intimidate! With all the money, political and corporate connections they have at their disposal they must certainly have a tremendously powerful influence over the ambitious and greedy men and women who enter politics. Grow a new vocabulary of possibilities – the new state will be the dawn of humanity’s great reconciliation. Muslims, Christians and Jews living together in Palestine as they once did. I agree with you, David. As I'd stated previously, there is a significant presence of Zionist Jews in the banking and financial sector. People having a strong interest in a particular country's welfare and possibly at the expense of everyone else. In his book "The Wandering Who" Gilad Atzmon also discusses the Sayanim, Jews loyal to Israel who live in the diaspora and whose loyalty is to Israel; these Jews are said to be working behind the scenes in all capacities (including committing murder), to protect Israel and promote Zionist interests. This is as much of a secret cabal as one would ever need, I would think. The organ theft case was a sleazy and nasty thing which I personally don't think had anything to do with any really powerful people. It also was a way for bigots to bring up the old "blood libel" issue. Very sad. Are the defenders of fake ‘Antisemitism’ losing their edge ? Thank you Maryam and Debbie. You both provide a lot of good information I would like to take a closer look at. PS Debbie, I have been called everything from a Hitler to a Jew lover by zionists. Their words have no power over me, because I have no respect for them. What got me so interested in this problem was my fifteen years' teaching in the 80s at a Jewish comprehensive school in Manchester. They were among the happiest of my life, and I'm still in touch with many of my ex-students. One thing that horrified me, though, was the propaganda to which the children were subjected. The same mantras are repeated even now: the 'human shield' argument, the refusal of Hamas (PLO in my time) to negotiate. Now Bob repeats one that I've heard over and over - that the arabs originally threatened to 'sweep Israel into the Red Sea', or something like. Can anyone tell me who is supposed to have coined that phrase? If some Zionist sympathiser on here(there is the odd one)can quote me the source, I'll hold up my hands gratefully.